Aero Systems Engineering, Air Canada, PW Cenco, Bombardier Aerospace, National Defence Canada, General Electric, GE Varig Brazil, MDS Aero Support Systems, Opron, Pratt & Whitney, Rolls Royce, Standard Aero. 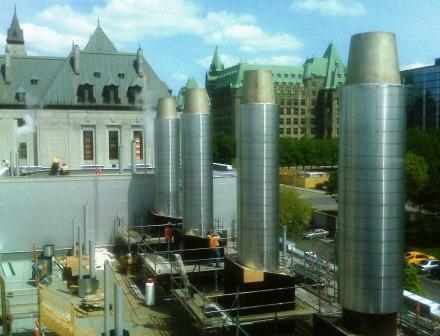 Argo Construction, Bell Canada, Comco, Girl Guides, Hôtel Chanteclerc, Hôtel E.K. Kanoo (Bahreïn), Immeubles Bourg-Chemin, Le Méritas, Le Rockhill, Développements Bellevue, Immeubles 822, Immeubles Salette, Les Deux Pierrots, Marofranc, Marzim, Mount-Royal Cemetary, Place Bonaventure, Place Laval, Ro-Na, Sanctuaire du Mont-Royal, Sona Oasis, Spa Mathers, Studio 408, Studio Omni-Son, Télé Métropole, Télémedia, Trizec, Université de Montréal, Université Laval, UQAM, Worth & Company Inc.
Alstom Power, Canadian Electrical Association, Boralex, Consumers Energy, Applied Utility Systems, GE-Energy, Gen-On, Foster Wheeler, Hydro-Québec, Incinérateur de Québec, McClure Modesto Power Station, Mirant, Public Works Canada, Recycled Energy Development, Rolls-Royce, Sept-Iles Hospital, Siemens Electric, Solar Turbines. ABB, Canadian Liquid Air, Alcoa, Arcelor Mittal, Canadian Steel Wheel, Cascades, Cliffs Wabush Mines, Crown Cork And Seal, Diversitech, Domco, Domtar, Doppelmayr CTEC, Doris Hosiery, Esso, Fibracan, Fonderie du Saguenay, IBM, General Motors, Goodyear, Groupe Bibeau, Ilco Unican, Armstrong World Industries, Irving Oil, Kruger, KHD, Masonite, Mitchell Lincoln, National Gypsum Company, Paccar, PPG, Rio Tinto Alcan, Rio Tinto Fer et Titane, Shellcast, Sintra, Société Canadienne du Sel, Solios, Soucy International, TLT-Babcock, Ultramar, Via Rail. Agnico Eagle, Canada Cement Lafarge, Cliff Mines, Québec Cement, Québec Lithium, St-Laurent Cement, Graymont, Mine Wabush, Mine Jeffrey, Mine Niobec, Sintra. Abbott Laboratories, Astra Pharmaceuticals, Hoechst, Johnson & Johnson, Merck Frosst, Omnispec clinical research, Pharmacy Brunet, Pharmacy Jean Coutu, Smith & Nephew, Montreal General Hospital, St-Luc Hospital, CSSS de la Gaspésie, CSSS de la Capitale Nationale, CSSS de l’Estrie.